Few now live who remember what caused it all to come crashing down, but come crashing down it did. Now scattered survivors fight amongst the ruins for the scraps. Some fight to keep the flame of humanity burning, others fight only for themselves and their depraved passions. Forsaken by God and Man, the Mutants of the End Time shamble in the shadows, some babbling insanely, others seeking refuge from persecution. Some, the Forsaken, wish for the most part only to be left alone as they live out their lives of quiet despair, amongst other equally horrible deformities. Others, the Predators, are vicious killers and merciless abusers of the weak, who seek out Unmutated survivors as a mantis does its prey -- don't let them catch you near their lairs or you will be pulled into the darkness. If this befalls you, pray for a quick death but don't count on one. 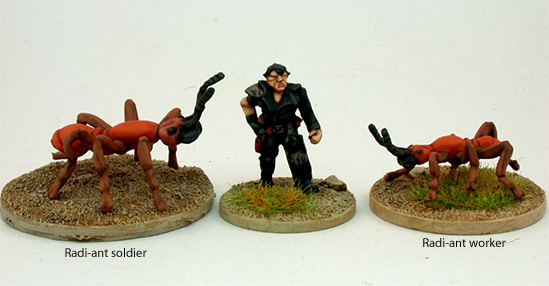 And then, towering over the rest, there are the Mutant Soldiers and Mutant Supersoldiers. Purposefully mutated in the Time Before as fearless, obedient warriors, when the End Time came they were set loose to prey upon a destroyed world -- fearless, some enormous, but far from obedient. 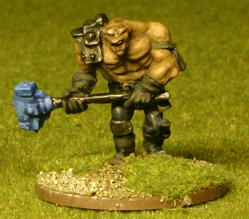 Some, especially the man sized Mutant Soldiers, carry various large caliber weapon), many others, especially the huge Mutant Supersoldiers, simply making due with cudgels or clubs of various types, often unearthed fixtures from the civilisation that was overthrown, to beat down creatures of lesser size and strength. 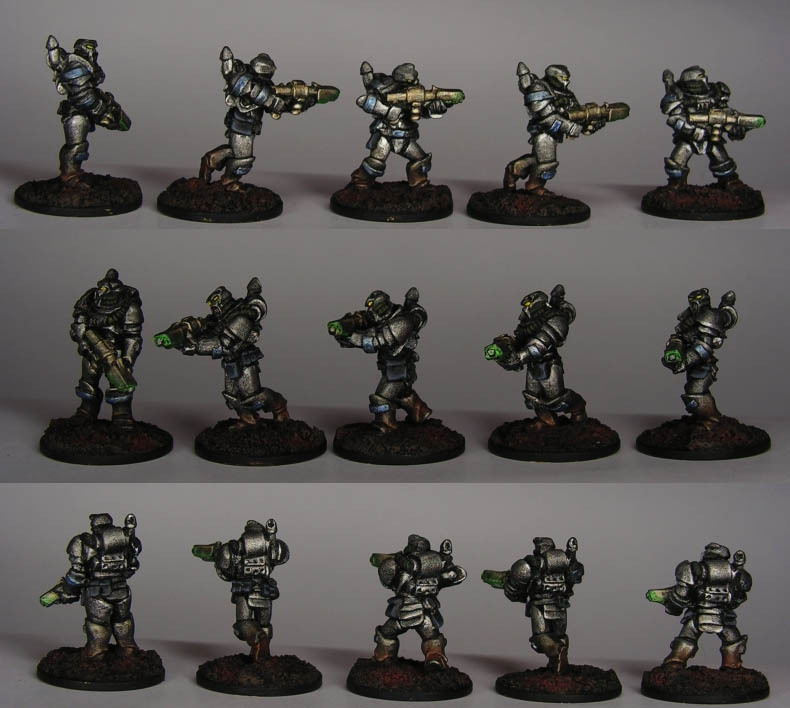 Acting as free agents, sometimes a handful of these terrors will command hordes of lesser mutants, or they may be bought or cajoled into cooperating briefly with The Unmutated. 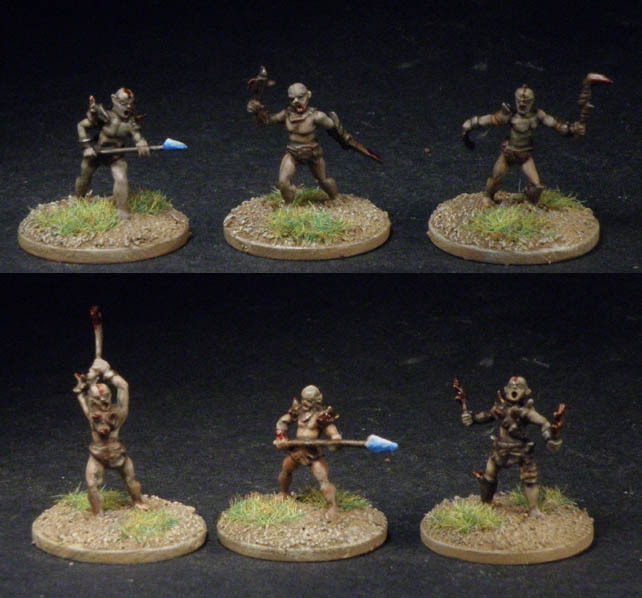 Most often, however, they will haunt the wastelands, singly or more often in small bands, setting upon the unwary like the ogres of medieval myth come horribly to life, seemingly immune to bullets and pleas for mercy..
Models sculpted by Ben Siens and painted by Artmaster Studios. Most government forces wear a power armoured suit that greatly enhances their strength and senses, and makes them all but impervious to small arms. 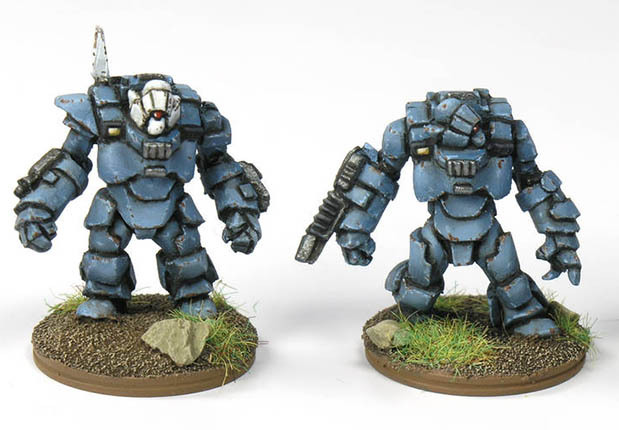 However, a select battalion, the Puritans, wear the dreaded Puritan suits, enormous and immensely powerful battle dress far greater in strength and sophistication than the power armour worn by other units. Only the few surviving government troops who are completely untainted by The Event are permitted to wear these valuable suits, and even then only if they are absolutely pure of mind and thinking (that is, fanatics). 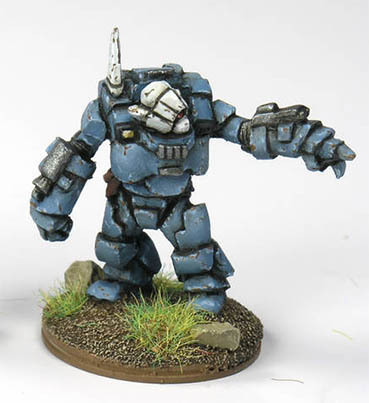 Rank-and-file Puritan suits are rigged so they may mount an optional autotargeting rapidcannon on their shoulders, which supplements the close-range weapons built into the arms of the superheavy armour. A specialist with an arm-mounted Toba Gun provides incredible armour penetrative capability. The leader of the government forces, the President, always wears a Puritan suit when he takes the field. 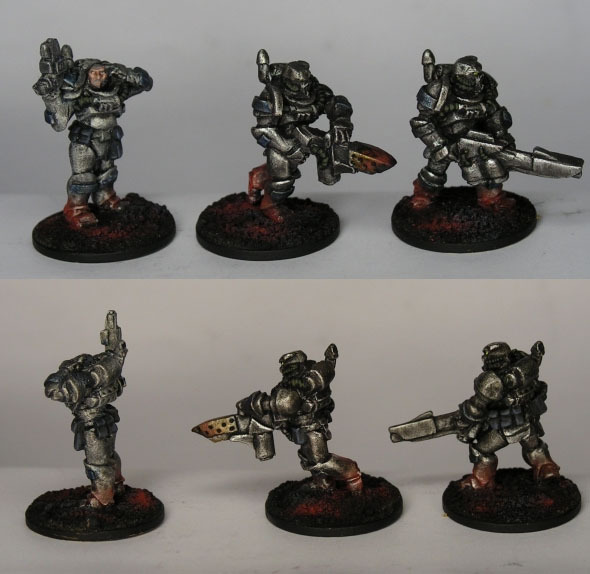 Wearing their heavy power armour, carrying deadly energy weapons, they can destroy all but the largest surface hordes � but can their small forces prevail and retake a madly mutating planet? And considering their merciless extermination of the so-called "impure," should they? Giant army ants heavily irradiated, the radi-ants have grown to huge size and voracious appetite. They are nomads and will take up residence in an area for only a few days to raid it until nothing is left alive. Kill one, kill one hundred, it is no matter -- there are always more and more to sweep over the landscape like a crawling tide. 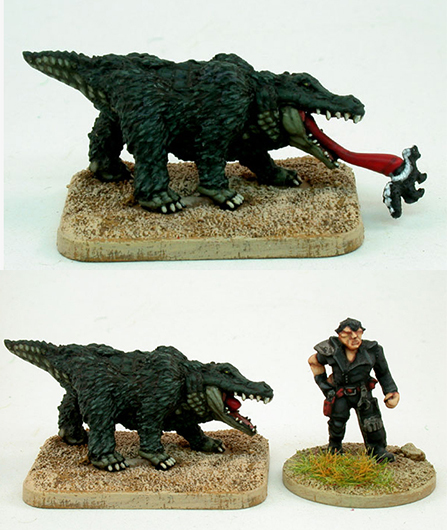 Their venom, toxic even before gigantism, is now vastly more deadly due to increased quantity and radiation. As the swarms move, the workers subdue and carry off prey. The soldiers protect the workers from interference with their deadly work. As this occurs, the queen is laying eggs in a temporary bivouac as she is heavily protected by soldiers. 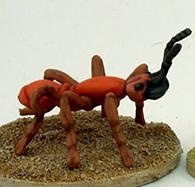 A note on the radi-ants -- in order to meet the demands of two-part moulds, these models are cast with legs which stick straight out at the sides. 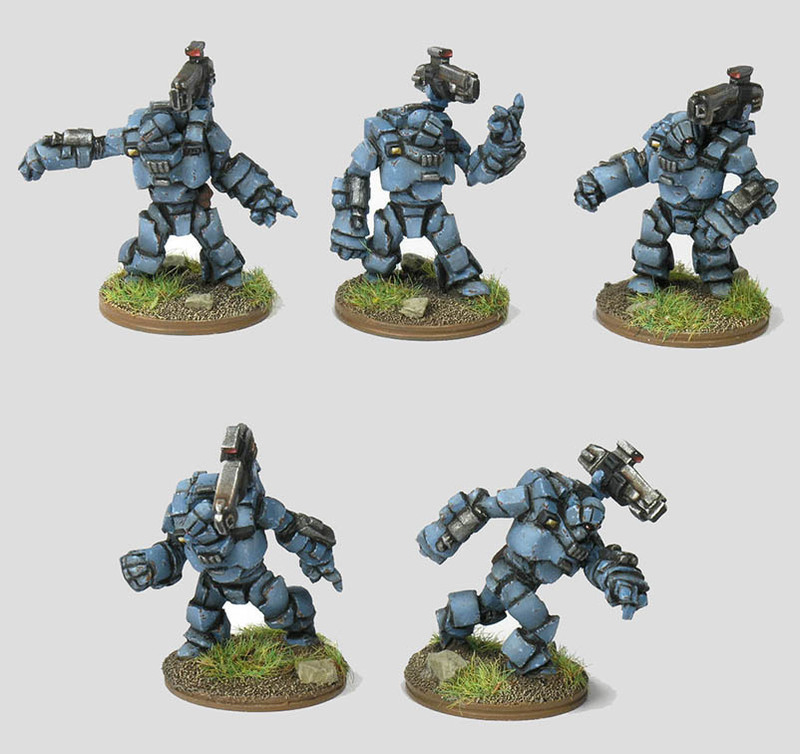 The gamer can pose them with careful bending at the joints. It's very important to be careful of course as too much pressure too quickly could snap the leg off. We will not be able to accept returns due to broken legs, so bend carefully! If you have trouble with that sort of careful bending, then these might not be for you. 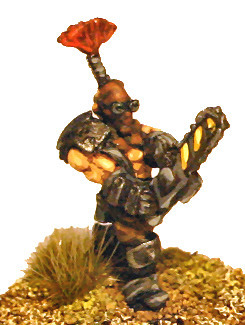 The human figure shown in the image below is for comparison purposes only and is separately available in the Heroes and Villains of the End Times pack. 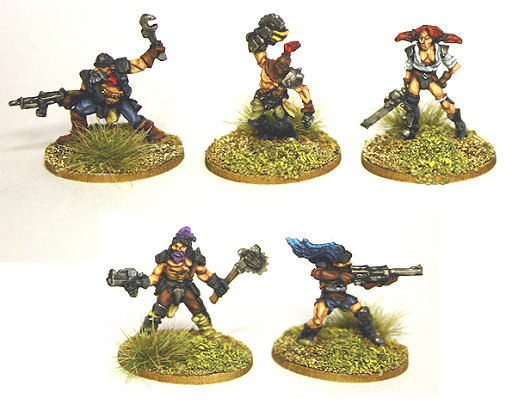 Models sculpted by Mike Lovejoy and painted by Steve Dean. 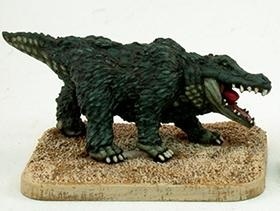 These creatures appear to be mutated alligators which have the posture, bulk and fur of a grizzly bear -- although the fur is in fact a type of downy feather. They wander the wastes devouring all life forms they can fit in their mouths, taking special care to track and eat skunks, whose noxious musk is stored in the Skunkeater's own body, and then emitted by the Skunkeater to help evade larger predators such as the Mojave Pilgrim. At times they also use this unbearable stench to immobilise prey such as human survivors. The powerful beast is aided in its hunting by a long sticky tongue which it can rapidly extend to catch small fleet animals -- such as skunks. 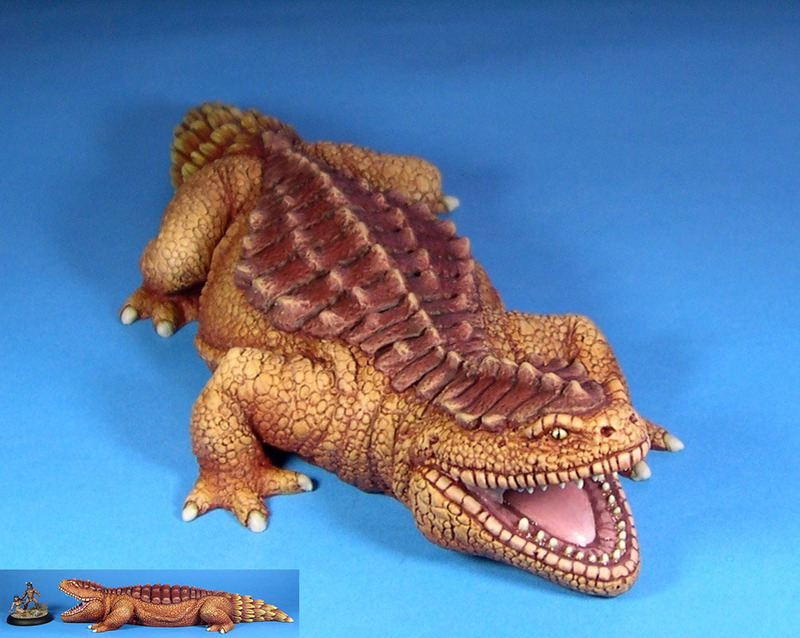 The model comes with two jaws -- one with tongue extended and another with tongue retracted. We've even included a skunk! This can be attached to the Skunkeater's extended tongue, stuck in the mouth cavity when using the jaw with tongue retracted, or simply used on its own. One of the apex predators in the End Times is a giant lizard, called by those still rational enough to use names the Mojave Pilgrim. Apparently some form of mutant skink, this creature does not level off at a full adult size, it just keeps growing as it ages, consuming larger prey as it grows. Originating in the Mojave Desert, the Pilgrim eventually devours all creatures in its territory and must then wander East, leaving the desert to find new prey, hence its name. It is not uncommon to find Pilgrims migrating across the charred landscape as far as Zone 15, their great bulk providing a self-perpetuating heat source even in much colder climates. Pilgrims appear to store the toxins coursing through the veins of their prey in glands in the base of their tails, and these monsters can spit a barrage of venom at prey for a distance as great as 20 meters. 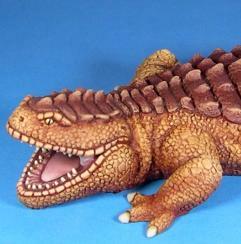 This model represents a medium-sized Mojave Pilgrim, being approximately 16m (50 feet) long. It is all resin and in two parts -- the top of the head and the body, making for a very straightforward build. 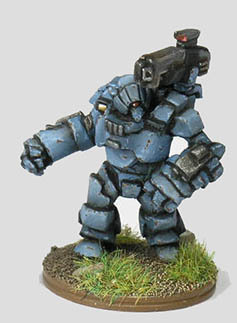 The model shown here was painted by Simon Bradley. Was the Infection part of the downfall of the world? Or was it unleashed from a secret lab? No one knows, but when it was uncorked, it infected humans with a terrible virus which changed them, physically and emotionally -- it altered their physical appearance, gave them great strength and agility, and a thirst for human flesh. Soon the Infected formed tribes, and as they bred their offspring were born with the infection as well -- hideous creatures with sunken eyes and sharp teeth, rampaging across the landscape like locusts. They are a blight upon a blighted world, and few are they who can hunt the Infected without being hunted themselves and consumed. Many strange creatures evolved in the End Times, but few were stranger than the hairless beasts that lived in tunnels in the ground, or in city sewers, breaking out enough concrete and asphalt so they could use gutter drains as access points. In the cities the scavengers called them gutter gophers, and the name stuck, even in the blasted wildernesses of the world. Silent on the approach, when they finally did attack one pack member would rear up and loose a deep bass howl that froze even the stoutest heart in mortal terror. It seems whenever there is trouble, one of more of them is there, or nearby. They are the heroes and villians of the End Time. There is The Highway Soldier, who haunts the roads in his supercharged black police pursuit cruiser, surviving at whatever cost, a loner unless he has to turn to others for assistance, sometimes a relucant ally of those who resist the more crazed of the survivors. And then there is Malice, who seems somehow to have been involved in the disaster from the start, but no one can say for sure how, not even Malice herself. A one-woman army, Malice has a firm sense of justice but can be pitiless -- with her two Uzis she stalks the wasteland destroying every Fecto she can find. 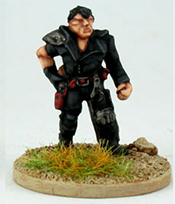 And then, of course, there is King Redwolf, lord of the Wasteland Empire. Crazed, deeply evil, with a cunning penchant for preying on the terror and unrealistic hopes of the weak, the King keeps the Road Outlaws under his thumb with regular doses of extremely excessive force, sometimes administered down the barrel of his precious .44 Magnum, a treasured relic of the Times Before. Other times he will simply use his own awesome phyical strength -- it has been demonstrated that, using only his bare hands, he can rip a human head clean off of the body. 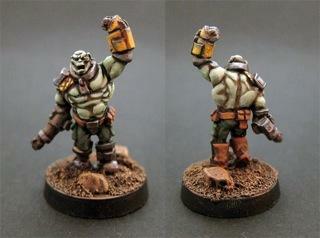 Sculpted by Ben Siens, painted by Steve Dean. 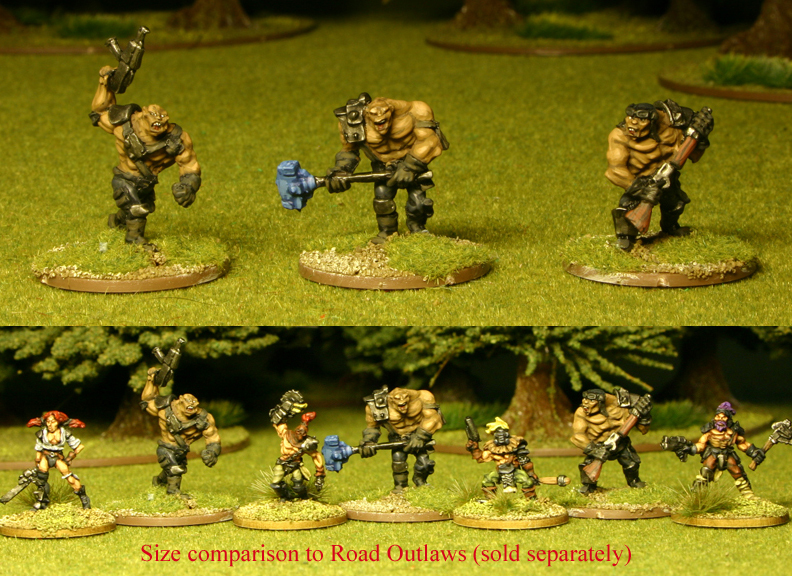 Frenzied ravagers like the heathen barbarians of old, the gangs of Road Outlaws kill for the sake of killing, to watch their foes suffer, steal what valuables they can from their victims, then proceed to fight over them. Some are expert gunfighters, others are mountains of muscle, wielding chainsaws to hack their foes to pieces. Line notes: Please note that the hair braid on the chainsaw-wielding maniac in pack END100 generally breaks off and will probably be loose in the pack. It is easily attachable by using a pin vise and some cyanoacrylate glue, perhaps reinforced with some epoxy, or the gamer may prefer to leave it off.